I agree with everything you wrote, I wish I was there. Wish you were here! I would have loved to have met you! This is my first conference and I won't be able to come back until 2018. We sure hope in 2017 you will be able to attend. I have caregiving duties that so I am landlocked. Maybe one day. I would love to watch the streaming of the famous Cocktail Hour, too! Wouldn't that be something?? I don't think you should immediately put 2016 on the back burner. I know your parents are a huge concern.....but no one knows what one year will bring. 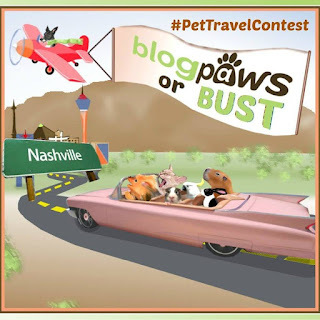 I have been to three of the BlogPaws conferences and they were all fabulous. That being said, the brands I am connected with did NOT happen from face-to-face contact at all. None of them. While face-to-face is great, you can make valuable connections online as well, without ever having met face to face. It just takes initiative, and creativity and the ability/confidence to sell YOURSELF. Selling yourself is much more important than even the statistics of your blog. Our Mom LUFFS the free stuff too. Hopefully you will get to go next year. I'm on the East Coast too, New England,a new blogger, but have met some wonderful people online and share your pain! We, too, are sad we are not at BlogPaws this year. Yous and my Mommy should gets together! She has wanted to goes to BlogPaws for 5 years, Nashville is on her bucket list! The workshops, well wes won't talks about those, they makes Mommy cry, Swag, nuf said Brands, Mes would gets a Tattoo for Fancy Feast and piece de resistance .... furrends! Wes would LOVES, LOVES, LOVES to meets them in person!!!! Purrhaps wes should has a pity pawty this week. Alls of us who is NOT going should has a pitty pawwty this week!!! and collects green papers and sends it to a good cause!!! I agree on all these points! This was my first conference and one thing I learned for next year - plan ahead and have all then numbers of bloggers you want to meet ahead of time. I missed several people I really wanted to meet. I am eager to attend next year so that I can meet more friends "in the fur". All of those highlights were quite wonderful! I didn't attend last year because of my mom's health condition. I didn't attend again this year because of personal reasons. I can relate to your post 100% Keep smiling, our year is coming! Aw, I didn't go this year either (new blogger). Hope to meet up with you soon.